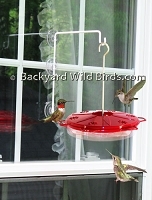 Window bird feeders bring lots of songbirds and Hummingbirds to your window for a close up view. 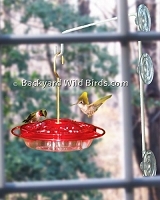 Window bird feeders really shine with Hummingbird nectar and thistle seed bird feeders because they don't attract squirrels. 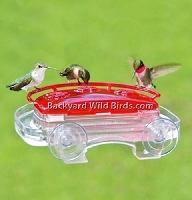 Hummingbird feeders should have ant guards or water moats to block ants. 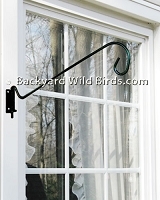 Special bird feeder hooks with good suction cups and brackets can be used to mount the window bird feeders. Great fun for all, especially kids, to see and learn about the different wild birds. Sunflower seeds are the favorite of a majority of songbirds and squirrels. 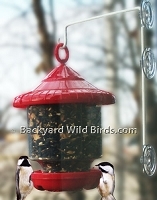 When using sunflower seeds it is difficult to Squirrel Proof a Window Bird Feeder because they can climb up siding and screens. So, you can take the approach that the squirrels will have access to the sunflower feeders and defend from there with wire mesh or wire screen feeders that have no open ports. 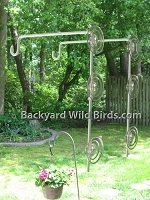 Thus, it is possible to have Squirrel Resistant metal bird feeders like the Window Squirrel Defender Bird Feeder below and still be able to attract and see a great variety of songbirds. 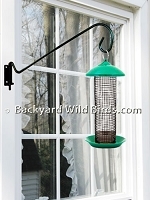 Green Songbird Sunflower Window Bird Feeder with mounting Hook is a bird feeder that brings songbirds right to your window. Excellent window bird feeder! 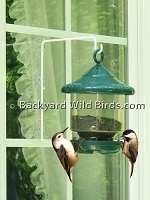 Clingers only at this Sunflower and mix seed window bird feeder with its sturdy hook packs a lot of seeds into a this bird feeder for your birds eye window view. 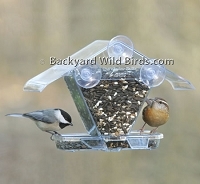 Window Cafe is a window bird feeder that brings wild birds to your window for a sunflower seed treat. Window Squirrel Defender Bird Feeder is a window 13" sunflower bird feeder that sheilds squirrel attacks with its all metal and wire mesh construction. Get a window sunflower feeder and defy squirrels. Window Squirrel Resist Bird Feeder is a window 12" sunflower bird feeder that resists squirrel attacks with its wire mesh all metal construction. Having a window feeder that scoffs at squirrels is possible!